Have you been thinking long and hard about working at home as a medical transcriptionist? Do you have previous experience in some capacity in the medical field? Would you be willing to train and just get out there and get some experience? Well, then keep reading because this article will tell you where to go to get started and get experience. If you already have experience, then there are work-at-home medical transcription companies that are willing to pay for that experience. This article will also cover a training option for those who are really interested in getting started in the medical transcription field. What Exactly is Medical Transcription and How Does it Differ From Other Types of Transcription? In general, there are three types of transcription: medical, legal, and general transcription. Medical transcription differs from the other types of transcription as it specifically deals with the medical field and the terminology used there. In addition to the terminology, it also deals with the many formats used, such as a prescription format verses a medical report. It can also be very specific to a specialty, sub-specialty or modality such as radiology or more specifically mammography or interventional radiology. In comparison, legal transcription deals with the legal profession including all of its terminology and various documents. And then general transcription deals more with business in general or intakes from seminars, workshops, captioning or authors dictating eBooks. What Skills Are Needed to Be Good at Medical Transcription? 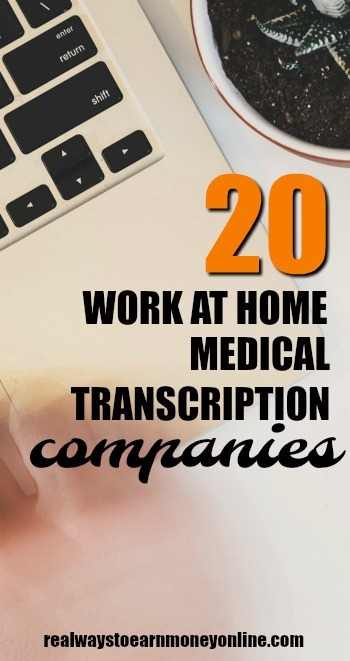 What Are Some of The Medical Transcription Companies You Can Work At Home For? Absolute Transcription – Founded in 1999, this company will hire you if you have 3 years of experience and can pass their test. You must be able to meet a 24-hour turnaround—no exceptions. Amphion Transcription – If you have 2 years of inpatient experience, then this might be your gig. You must also pass the 2-hour test as well as meet the equipment and computer requirements. Eight Crossings – This company prefers to hire medical transcribers with two years of experience, but will hire those without experience who have recently graduated from training programs. GMR Transcription – Read GMR Transcription Review – This company hires from US and Canada only. If you can pass the grammar and typing tests, you are in without experience. M Modal – This company will hire those without experience or newly hired AHDI (Association for Healthcare Documentation Integrity) certified. Offers both medical and legal transcription and pays by the line. Net Transcripts – Read Net Transcripts Review – This company now hires medical transcribers to go with their legal and law enforcement transcribers but only in the US. If you can type 80 words a minute and have good grammar, Net Transcripts would love to talk to you. Net Transcripts prefers to hire experienced transcribers, but will accept those who can type 80 wpm and pass a basic test. Northeast Transcription – This company will hire recent graduates with 6 months experience, whether it was work-at-home or in a clinical setting. Nuance Transcription – This company will hire those with a minimum of one year experience in an acute-care type of environment. This would include physicals and discharge notes. NThrive – This company used to be called Precyse, but has changed its name. They require 3 years' experience with knowledge in all areas of medicine. Thrive does offer training. Penrad Imaging – If you live in Colorado and are able to do on-site training for 3 to 5 weeks, then this might be for you. They require a minimum of 6 months' experience. Perfect Transcription – While they do tend to pay better than the others, they require 3 years of experience with 2 of those years being in a specialty (oncology, urology, podiatry, etc.). Precision Transcription – This one hires both part-time and full-time workers to work from home as independent contractors. All shifts are available and you must have a minimum of 3 years' experience. Preferred Transcriptions – This company requires 2 years' experience and has 24/7 work. Clients need 8 to 12 hour turnaround times and many dictate from their cell phones. SameDay Trancriptions – You must apply to start the assessment. This company only hires experienced medical transcribers to produce quick turnaround transcriptions. Softscript – This transcription company requires 3 years' experience and you must have excellent grammar and computer skills. SpectraMedi – This company requires experience. They also have openings for medical billing and medical coding. StenoMed – This company hires experienced medical transcribers only with advanced knowledge of medical terminology and procedures. StenTel – Once you fill out a questionnaire, you will be contacted to determine if you are a good fit for StenTel. Most of their medical transcription revolves around health insurance claims. They do require experience. UbiQus – Read UbiQus Review – This company will hire medical, general, and legal transcriptionists with or without experience. You will need to be able to type 70 wpm though and pass the typing test. Verilogue – Read Verilogue Review – This is probably one of the most “heard about” companies when it comes to working at home doing transcription as an independent contractor. They prefer to hire those who are fluent in another language as well as 2 years of experience in medical transcription. If you are really serious about medical transcription and feel that you need training, you might want to consider training at CareerStep. CareerStep has been written about on this blog before. CareerStep has a good reputation and has been in business for over 20 years and allows students to go at their own pace and finish their course within 3 to 12 months. They also offer placement as well as have a reputation for being “military friendly” to both the enlisted individual and military spouses. So, there you have it. Medical transcription companies that will hire you and a place to get training — should you decide to pursue this option. Even though many of these companies — not all — do require some experience, don't let that deter your efforts. You can always find freelance medical transcription jobs on Upwork, Guru, Virtual Vocations, and Amazon Mechanical Turk to name a few. Good luck to all of you who choose medical transcription as a work-at-home career. Medical Transcription is no longer the career it used to be. Since August 2017 most of the work has gone and there is very less work and pay is also also not very good now. I tried applying with GMR transcription and I tried 2 different emails in order to get the test they require, and I never got those emails. Not too happy right now. I tried contacting them about it, and got no help.